TAE YANG Co.(www.9258.co.kr) unveiled various types of boots equipped with EVA air technology and other functions at Busan International Shoe Show(BISS) 2014 at BEXCO Exhibition Center on September 25th to 27th. TAE YANG Co., a leading company in the industry, has produced and researched only boots and rainwear products so that they registered 4 trademarks, 2 patents, and 61 designs officially. 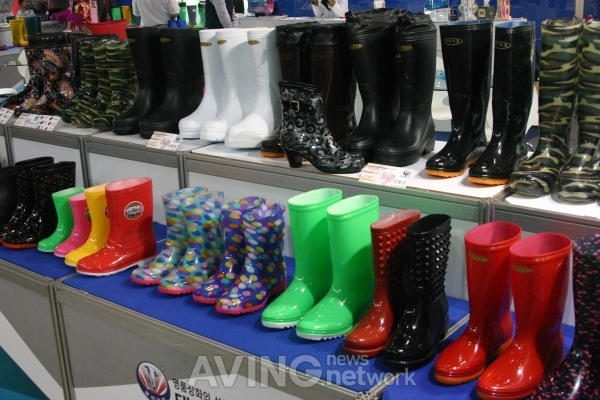 PVC safety boots production method is the nation's first development so its technology received patent registration. What's so special about PVC safety boots is that other competitors adopt injection molding for the first process and run glue work for the next process, but TAE YANG Co. runs whole molding process so that this method ensures high waterproof function. Its neck is very wide so gives a user comfortable shoe removal experience. Anti-bacterial boots are made of material mixed with anti-bacterial property, and its special sole provides nonskid function to prove the boots are indeed multi-functional. Other than these, TAE YANG Co. exports their products to Japan, Russia, and Canada, and their freeze boots can withstand freezing negative 60 degrees in Celsius to maximize freezing effect but still its weight is so light that the company registered the world invention patent. Under the theme "Fun&Business," BISS 2014 was hosted by Busan Metropolitan City and organized by Footwear Industrial Promotion Center. The show invited 120 companies that filled up 260 booths.